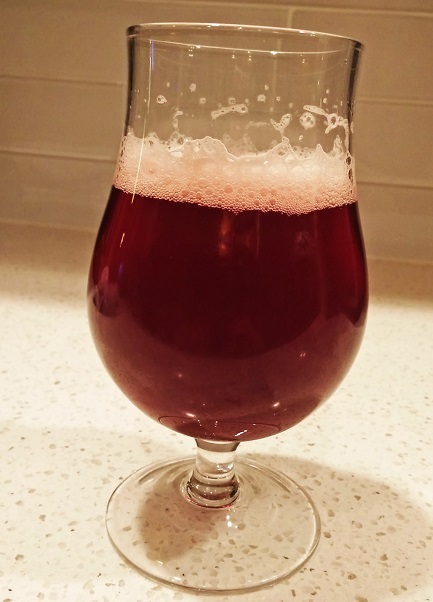 I reread Mike’s post on brewing fruit beers and I dreamt up this all grain blueberry ale recipe that balances sweet (from the malt), spicy (from the hops), and tart (from the berries) flavors into one beer. You’ll need a secondary fermentor for this recipe. 0.50 oz. Perle (Pellets, 8.25 %AA) boiled 60 min. 0.50 oz. Saaz (Pellets, 5.00 %AA) boiled 15 min. Mash grain at 150 degrees for 1 hour. Boil for 60 minutes and ferment at 68 degrees for 2 weeks. Add fruit puree to secondary fermenter and rack beer on top of it. Let beer condition for 1 week. Prime and bottle or rack to a keg and force carbonate for another 2 weeks of conditioning. I brewed this beer again last summer, 9 years after I formulated the recipe. Today I was asked if I could write up some tasting notes and maybe finally get to posting a photo of the beer. Hey, better late than never. Thankfully, I had two bottles stashed away so I opened one up to do a proper review. Appearance: As you can see, you can get away from the blueberry color in the beer. The first impression show a reddish-purple but with some amber highlights. The head is reddish-white with a good bubble structure. Aroma: The aroma is very fruity, almost wine-like in its bouquet. It’s like a really floral honey. It’s reminiscent of lilacs – a real sweet smelling flower. Taste: Big fruit right up front – a lot of real Main blueberry flavors. It gives way to some caramel maltiness and then finishes with some pleasant hop bitterness. Mouthfeel: I am surprised that the mouthfeel is medium since the aroma sets me up for a real thin beer. The malts bring the body and it brings the experience up a level. Overall Impression: This is a real fruit ale. Your notions of fake blueberry flavors should be abandoned before you take a sip. What you are given instead is a great representation of the berry which is backed up with hops and malt in the aftertaste. Any chance we could get a photo of the beer, I’m curious as to the color of the finished product? Absolutely. I think it’s gonna be reddish. Maybe even violet-ish. FWIW, I just finished off a keg of Blueberry Wheat that I brewed and just to let you know, the color was a violet red color. I used 2 1lb. cans of Oregon Fruit. It was whole so I pureed it first and racked on to it after primary was done, then let it sit for a week. I didn’t get any blueberry “flavor”, just a tartness that went really well with the wheat beer base. Any info is definitely worth a lot. Thanks for the insight into your experience. I think the tartness is what I am looking for with the addition of the blueberries. Just started primary ferment on this recipe last week. It went crazy for a day or maybe a little more, then just stopped bubbling all together. Been trying to keep it at 68 degrees, but it has been above and below that. Would you drop in another batch of yeast or just let it sit until time to rack to secondary with the blueberries? I would let it sit. If you used the strain in the recipe, it’s going to be a fast starter and mellow out after a few days. It’s ok. It’s still working. Let it sit until it’s time for the secondary. Thanks, John. Looks like it’s doing just that. Will be ready for the secondary in a few days. My first fruit beer, so I’m looking forward to it! There’s no mention of priming sugar in this recipe. Does that come from the blueberries or do I still need to add corn sugar? Yes, use priming (corn) sugar at bottling. Is there any sort of sanitizing that should be done for either the blueberry puree or the can it comes in prior to putting it in the secondary fermenter? Thanks John. The blueberry puree should be pasteurized so the contents of the container are good to go. I would sanitize the outside of the can and your can opener before putting it into the fermentation vessel. Brew on! How many gallons does this recipe make? I am wanting to make anywhere between a 1 to 3 gallon batch. I can break down the amounts if this is for a standard 5 gallon batch. Thanks! The recipe is for 5 gallons so you can break it down. Brew On! Still waiting for that picture huh? lol How about a review of how the beer actually came out? Ha – I brewed this recipe again over the summer and I have a bottle in my fridge. I’ll pop it open and take a picture. After that, I will drink it and review it. The puree in the recipe is more concentrated than whole berries so I would go with 2.75 to 3 pounds of whole berries for the same ratio that this recipe is calling for. BREW ON! 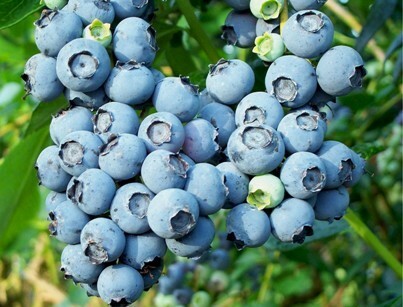 I am very interested in this recipe as I have 10 pounds of fresh picked Maine Blueberries. Unfortunately, I don’t have equipment to do all-grain. Can someone recommend an extract based substitution? I would use 6.75 pounds of Liquid Malt Extract (LME) or 5.4 of Dry Malt Extract (DME). Get the lightest color of extract you can get. BREW O!